Before my research and advocacy on type 2 diabetes I though diabetes was a crippling and killer disease. Type 2 diabetes can be a crippling and killer disease only if you let it. Here are eight myths of type 2 diabetes. Type 2 diabetes is a chronic hereditary disease. Myth. Type 2 diabetes (T2D) is a dietary disease, not chronic nor hereditary. The only way that it is in any way hereditary is if you eat the same high carb and high sugar diet as your parents. If you were brought up eating a high carbohydrate and a low fat diet then, of course, you have a greater chance of developing type 2 diabetes. For years the way to eat was high carb low fat diet. The diet included high carb foods like grains, pasta, potatoes, bread, pastries, desserts, sodas, and sugar. All of the foods are very high on the glycemic index rating. The trend also was to eat lots of trans fat, sugar additives and margarine which is very bad for your body. Eat a Low Carb High Fat (LCHF) diet this consists of natural, unprocessed foods and is better for your diabetes. LCHF diet will reduce your intake of carbs, and you will eat natural foods until you are satisfied. Herbal Supplements will help to lower and cure type 2 diabetes (T2D). Myth. Companies are producing the so called wonder herbal supplements that claim to cure type 2 diabetes. These supplements in combination with your normal routine diet will have very little effect if any at all. The program will tell you to modify your eating habits and take the supplements in conjunction with a revised diet. If it suggests an LCHF diet then, of course, it will work. You will gain better results by going to a Low Carb High Fat diet, and you will not need any supplements of any kind. It will lower the risk of cardiovascular events (stroke and heart attack) by up to 2 times. If you have diabetes and are using any medication or supplements, you are looking for a quick fix. Taking supplements of any kind is costly and time consuming. The supplements have a disclaimer if you have liver and kidney issues, do not take. It could cause allergic reactions, so what is the point in taking the supplement? Who is kidding who? Get off of medication and supplements and eat natural foods. Diabetes and obesity do not go hand in hand. Myth. There are currently 1 billion people that are prediabetic or diabetic in this world. The numbers are staggering and beyond epidemic proportions. In most cases the people are obese or close to it, the numbers are in the 80 % range. Of course, you can be slim and still be type 2 diabetic. Diabetes does not pick and choose but favors obesity. Another word for diabetes and obesity is diabesity, the word speaks for itself. Eating an LCHF diet, exercise and intermittent fasting will help to get your A1c down to a normal range, and once you lower your A1c, you will quickly lose weight and lose inches off of your waist. If you are diabetic, you will end up taking insulin. Myth. The main point for this myth is you must take care of your diabetes. If you take diabetes lightly, then yes you will end up on insulin. Insulin resistance and high blood glucose are toxic to the body. Make a change in your lifestyle by changing your diet over to LCHF and stop eating sugar. Only you can make this change. Start as soon as you get word from your doctor or health practitioner. If you do not know you are diabetic and think you are, then see your doctor and ask for a Hemoglobin A1c test. You do not have to do any fasting, but I would suggest you get other tests done, so you will have to fast for 10 hours and then get your blood work up done. Diabetes left unchecked can lead to insulin, but only if you let it. Do not let diabetes control you. It is a slow and painful way to suffer and then die. If you get diabetes, you will go blind or have a limb amputated. Myth. The only way that you will go blind or have a limb amputated is if you let diabetes defeat you. Diabetes and high blood sugar are very toxic, and in the long term yes it can lead to blindness, stroke, cramps, slow healing wounds, and amputation. If you take control and the sooner you do it, the sooner, you will be on your way to normal blood sugar and better health. Start by getting rid of all the junk food high carb foods in your cabinets, pantries, fridge, and freezer. Next trip to the grocery store buy LCHF food and start eating naturally. You have to get off of medication and eat naturally. Start today. Type 2 diabetes cannot be reversed. Myth. Will your type 2 diabetes get progressively worse? My answer to that is yes, if you listen to your doctor and do not change your lifestyle. Many people have lowered and in fact defeated type 2 diabetes by making a lifestyle change. I am proof that type 2 diabetes can be reversed, along with thousands of others. How do you reverse type 2 diabetes? Make a change in your lifestyle. This means changing your diet, increase exercise and start fasting. Eliminate sugar from your diet this means no high carb junk foods and processed foods. Stop drinking juice, pop, and sodas. Stop eating snacks, cookies, pastries and so on. Carbs are equal to sugar. Start walking, and increase the time you walk for as long as you can comfortably do. You must eat at least three meals a day with snacks. Myth. Eating three meals a day with snacks has been burned into everyone’s mind and is wrong. It is an old mother’s tale handed down from generation to generation. Type 2 diabetes is a dietary disease, let me repeat that, type 2 diabetes is a dietary disease. The more junk food carbs you eat, the more sugar you intake and the higher your blood sugar goes. Eat an LCHF diet and fast every day for at least 12 hours, and 2 times for 16 to 20 hours. You will find that once you start fasting, you will lower your A1c and lose weight naturally, almost at will if you want to. No snacking on junk food. You can eat LCHF until you are satisfied. I stress that you only eat until you are satisfied. Continue to eat LCHF and fast until you have dropped your A1c to a normal level. Diabetes is a Crippling and Killer Disease. Myth. Diabetes is a crippling and killer disease only if you let it control you. Continue to eat junk food carbs and sugar type snacks and of course you are in for a slow crippling death sentence. Not only do you have a chance of being killed by diabetes but the other diseases associated with metabolic syndrome and cardiovascular issues. Although carbs are highly addictive you have to change your eating habits and eat healthy. LCHF is the only way to go. You must want to do this, and I cannot help you. Only advise you. You have to want to defeat diabetes. Put time into educating yourself and stop any excuses that may pop up. I do not want to hear that you are too busy, have no time, will start tomorrow, and any other BS. I put time into researching, testing and living the lifestyle and am still maintaining my health. The healthy lifestyle is something that you will continue to do for the rest of your life. I will inspire you to keep on going. I am on your side, so start today and have a great journey into health and wellness. These are the eight myths of type 2 diabetes. Before making any changes to your diet or lifestyle consult with your doctor and or health practitioner. Start reversing diabetes right now. I welcome and appreciate all comments, questions and or concerns. Good, bad, or indifferent, please let me know what you think. Many thanks for reading this post and dropping by. Previous Previous post: Can Too Much Sugar Cause Diabetes? Wow you have taught me some new things. I personally am not diabetic. But I have been around people my whole life who were. I know there are different kinds of diabetes and of course circumstances change with each type. But first off I had no idea you could actually be cured of type 2. I always believed that you could get it under control and maintain it but not completely be rid of it. So I have a question, I am not sure what type it is but one of them is hereditary right? Or am I thinking of one of the myths? In response to your statement can you actually be cured of type 2 diabetes. The answer is you can lower your A1c to the normal range through a lifestyle change. The best way to do it is through diet, exercise and intermittent fasting. Once you have a achieved lowering your A1c you still need to maintain it, by continuing with the lifestyle change. In answer to the question is type 1 diabetes hereditary? It may or may not be as it has more to do with the pancreas not able to secrete enough insulin when food (carbs and protein) is consumed. A person could have an injury to the pancreas and if the pancreas is damaged and unable to function in a case like this the person would become a type 1 diabetic and would need insulin to regulate the glucose. My last word is cut down on your sugar and processed food intake and you will lead a healthy life. Thank you so much for the very detailed answers. I have always wondered about these questions. I am so glad to hear you can cure Type 2 diabetes. And as you mentioned I know your eating habits and exercise has a lot to do with it as well. I hope they can figure out if type 1 can be hereditary at some point. It might just help us in the long run with more answers. Changing your lifestyle by dieting, exercise and intermittent fasting is the only way to keep your type 2 diabetes in check. Even though type 1 can be hereditary it has more to do with the pancreas able to function properly after digestion. Stay healthy, thanks for dropping by my site and commenting. Jimmy, after reading this post, I wonder whether I am pre-diabetic. I do have 12-16 hours fast once or twice a week, and am mindful of my intake of sugar – during the Lent period leading to Easter (which being Catholic, I like to observe in some way), I gave up all things sweet, such as my weak point biscuits, but also anything else which would appeal to my sweet tooth. And guess what, albeit only for some 5-6 weeks, by the end of it not only my cravings for sweet taste in my mouth had disappeared, but I actually felt much better. You are right when you suggest that a good diet can reverse Type 2 Diabetes. My colleague from many years ago not only lost weight, but – her main goal – she got rid of the diabetes altogether. My aim whenever starting a dietary regime, is not so much to loose weight – though I do need to shed a few kilos – but to improve my well-being. In other words, to just feel better. You have given me the right boost to … start again! You are definitely on the right track. Limiting sugar is a good idea. If you want to know whether you are diabetic, you should go to your doctor and get your Hemoglobin A1C checked. If your Hemoglobin A1c is 5.5 or less you are not diabetic. 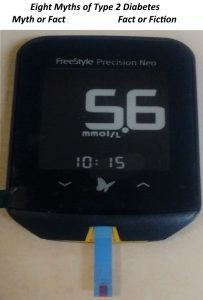 5.5 to 6.0 prediabetic and above 6.0 diabetic. I was type 2 diabetic for a long time and have lost 35 lbs and 4 inches off of my waist. I did that in less than 2 months and can lose weight at will by fasting. In the last year I have maintained the same weight and anyone can do it. It is no secret, eat healthy whole natural food, the food I eat is a Low Carb High Fat (LCHF) diet, fast for 5 days a week for 12 hours and 2 days for 16 hours. This means no snacking of any sort between meals. I try to walk for at least 1 hour a day. The result that I attain may be different from someone else but you need to experiment a bit to determine what works for you.